The other day, I smelt lilac for the first time this year. 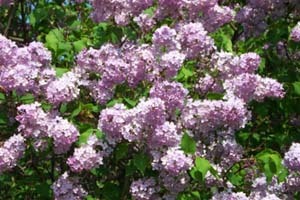 There is a row of lilac bushes that I pass on my way to campus. Last spring, walking past them daily became one of life's simple pleasures. and good things will happen." I don't like to walk past them without stopping to inhale. I feel like I'm wasting a precious chance. The frailty of spring weighs on me a bit. More often than most people, probably, I wonder which sense I would give up if I had to give up one. Usually I say smell because sight and sound are too precious to me. But I'm glad that I can smell lilac.